﻿ The Jack Gordon Site :: Jack Gordon served in the Navy during World War II. 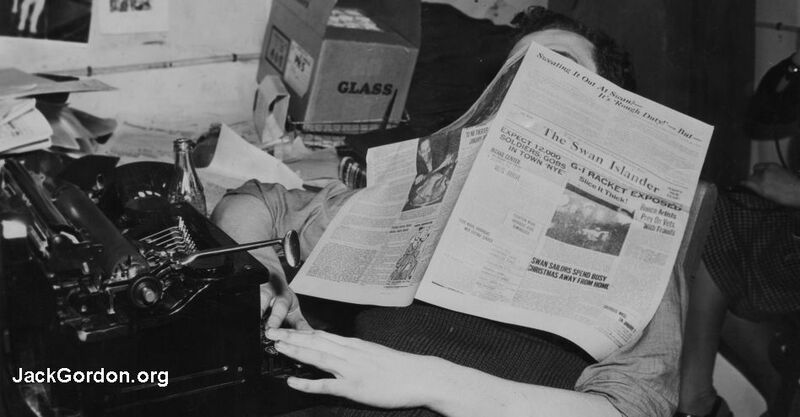 December of 1945 saw Editor Jack recovering after putting the New Year's edition of The Swan Islander to bed. March 30, 1943 (from issue Vol I, Number 22) covers Al Ulbrickson and more. October 27, 1943 (Vol. 1, Number 52) Cover page and Page 1 Honoring Navy Day and the Sky-Writer's 1st Anniversary.